Edinburgh University is the location for the latest instalment of the expanding Perspectivity community. 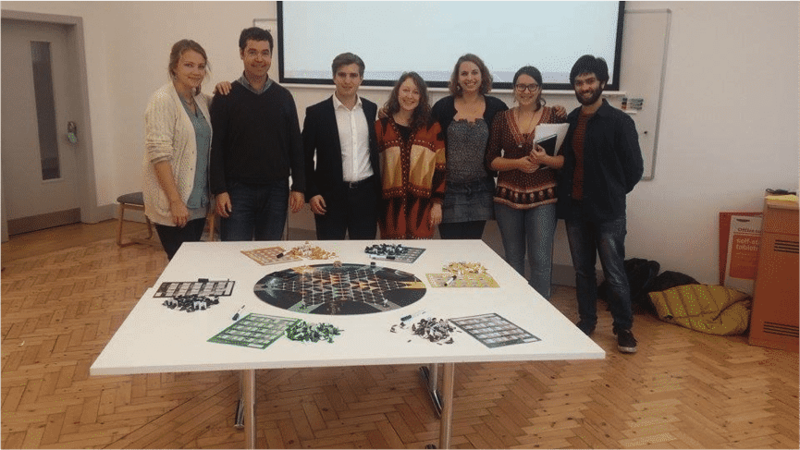 In November as part of the Universities Sustainable Economy Week, a group of international students organised a Train the Trainer Session as well as an open game session and received their training from Michael Donnelly. The initiative to start a Perspectivity Group at the University was the brainchild of Politics and History student Jovan Rydder who first experienced the game as a 14 year old in India and who thought it would be helpful to bring the ideas of Perspectivity to Edinburgh. Jovan was trained alongside Anne Zerr, Laura Ann, Marie Larsson, Maximo Cirio, and Nikolett Angyal. The students are all part of either the Amnesty International Society or the Sustainability Society at the University. The newly trained Game Leaders hosted a game session and de-brief the following day at the Edinburgh Centre for Carbon Innovation. The students have plans to increase the number of games being played in Edinburgh with the next session already scheduled for the New Year. The goal is to embed the game session into some of the courses as well as getting more training on the methodologies that the game identifies as being necessary for effective dialogue.